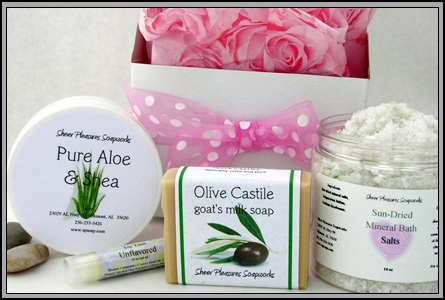 A wonderful pick-me-up for someone going through a rough time in his or her life, this gift set includes a jar of detoxifying Sun-dried Mineral Salts for use in the bath after treatment, as well as a jar of Pure Aloe & Shea Butter for soothing dry or radiated skin, a lovely bar of olive castile soap and an unflavored, non-petroleum lip balm. None of the included products contain fragrance, which can aggravate the nausea associated with treatment, just pure pampering and soothing. As a breast cancer survivor, I am all about making it a little more bearable. We will gladly include a card expressing your sentiments if you provide the text for that on the shopping cart page in the comments box. A great way to say "I care".